The MIC2800 is a high performance power management IC, giving three output voltages with maximum efficiency. Integrating a 2MHz DC/DC converter with an LDO post regulator, the MIC2800 gives two high efficiency outputs with a second, 300mA LDO for maximum flexibility. 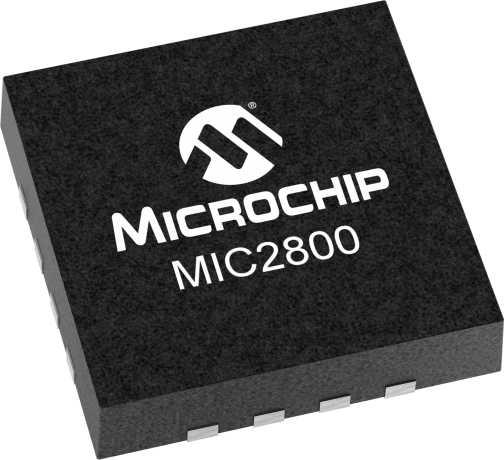 The MIC2800 features a LowQ® mode, reducing the total current draw while in this mode to less than 30µA. In LowQ® mode, the output noise of the DC to DC converter is 75µVRMS, significantly lower than other converters which use a PFM light load mode that can interfere with sensitive RF circuitry.The DC to DC converter uses small values of L and C to reduce board space but still retains efficiencies over 90% at load currents up to 600mA.The MIC2800 is a μCap design, operating with very small ceramic output capacitors and inductors for stability, reducing required board space and component cost. The MIC2800 Evaluation Board is used to demonstrate the capabilities of MIC2800 PMIC which can deliver 600mA from a DC/DC buck converter and 300mA from each of the two stand-alone LDOs. The board accepts an input voltage from 3.6V to 5.5V and will deliver an output voltage of 1.8V for the DC/DC converter, 1.25V and 3.3V from the LDOs.